The products mentioned are trademarks of their respective owners and are not owned by or affiliated with Safemeds4all or any of its associated companies. That medicine supplied are for personal use, not for commercial exportation or importation by mail and is not for a re-sale. You are purchasing it because it is unavailable in your country. 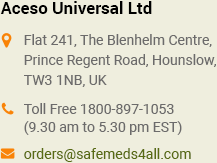 Safemeds4all is not liable for any customs and legal implications including forfeiture, seizure and / or auction. Any such legal implication or notice shall be forwarded to the purchaser.